The entire Lasallian family is invited to participate in National Vocation Awareness Week (NVAW) November 6-12, 2016. The week invites the broader Church, and our Lasallian family, Brothers and Partners, to rededicate their energies to promote a culture of vocations with a special focus on consecrated life, the priesthood and the diaconate. Through prayer, promoting a culture of vocations in their ministries and inviting reflection, Lasallians are called to foster opportunities to share and explore their vocational journeys. NVAW will focus on the theme “Deepening and Discerning God’s Call in Your Life” and how we can all, as student, teacher, coach, parent, Brother, priest, counselor, sibling and friend can make more intentional time for prayer and discernment in our lives. 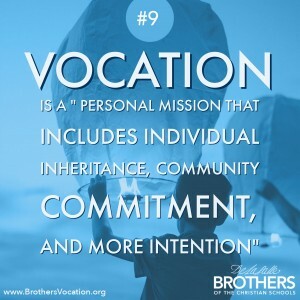 The Brothers Vocation website will host a five-day online retreat experience. Each day will have a few different modules that can be completed individually or in a group setting in 20-30 minutes. The online retreat will be available during NVAW as well as remain available as a vocation and discernment resource.